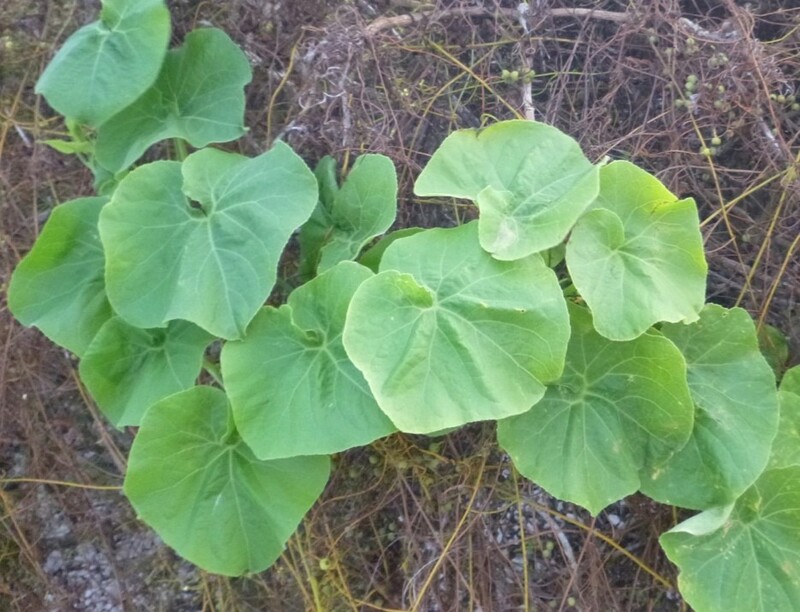 ʻAnunu is an annual vine in the Gourd Family (Cucurbitaceae) which includes cucumbers, watermelons, and pumpkins. The leaves are large, roughly elliptic, and the stem is stout. No other plant on Kure produces cotyledons at nearly this size. The first true leaf is sometimes almost maple-leafed in shape and somewhat toothed at the margins. The true leaves grow in one at a time and become more rounded as they grow out on a long stem. The large size and light color of ʻanunu leaves make them good at camouflaging Verbesina. ʻAnunu or puaokama, is endemic to Kure and has become rare in the NW Hawaiian Islands. It is also endemic to Pearl & Hermes, Lisianski, Laysan, Niʻihau, and Oʻahu. On Kure, it is most commonly found in the restoration area named “Anunu” and in the central plain. Lots of insects such as aphids and mealy bugs can be found on the underside of the leaves making this an ideal place for Laysan ducks and shorebirds to forage. There are dense ‘anunu patches throughout the central plain and it grows readily on and over naupaka without killing it. Seeds are collected for propagation.